Important historic letter in which Einstein, surprisingly, expresses his opinion on internal Israeli politics and also criticizes the American and British attitudes towards Zionism. In the 1940s, there was a struggle over the leadership of the Zionist movement between two leaders, each of whom maintained a different approach to the goal of the Zionist struggle. On one side was Chaim Weizmann, a statesman who reasoned that all activities must be coordinated with the British, and that the Zionist movement must not fight the British government. On the other side was David Ben-Gurion, a seasoned politician who was far more in touch with the movement on the ground, and promoted said struggle. On a deeper level, there was a personal conflict between the figures. Weizmann was a famous scientist who had connections with world leaders but was not very connected to the Israeli experience. Opposite him was Ben-Gurion, a worker from Sejera who made his way up "from the bottom" by establishing the Histadrut, and who ruled on the ground undisputed. The contest between them was decided in 1946 at the Zionist Congress, against a backdrop of the disagreement about the Jewish resistance movement. Weizmann quit his position as president of the World Zionist Congress. He returned to the United States and resumed his work as a scientist, but also continued his diplomatic activity for the Jewish state. On May 14th, Ben-Gurion declared the Jewish state. Two days later, on Sunday, the first meeting of the people's provisional council took place. It was decided there to appoint Weizmann (possibly as compensation for rejecting him two years earlier) as president of the state council. Three days later, on May 19th, Einstein sent him a letter of greetings, which is the letter before us. 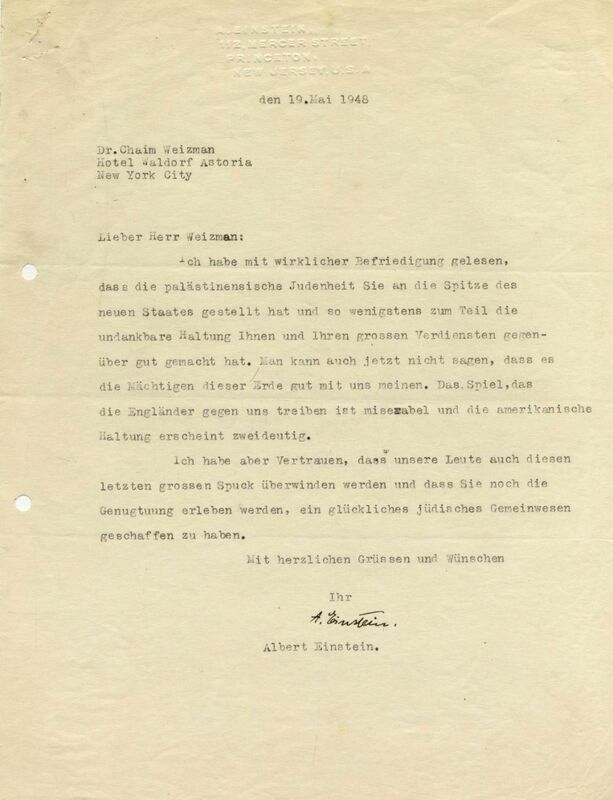 The letter: In the letter, Einstein expresses his satisfaction regarding the decision by Palestine Jewry to appoint Weizmann "head of the new state," so that, at least partially, he is compensated for the ungrateful conduct regarding him and his merits. He adds that even at present (apparently referring to the situation of the Jews post-Holocaust), world powers do not treat the Jews properly, with Britain playing a "miserable game" against the Jews (referring to the lack of British support for Zionism), and the ambiguous American stance (Weizmann himself met with Truman on May 13, three days previously, and tried to convince him to recognize the existence of the state of Israel). Nevertheless, writes Einstein, I am sure that our people will also overcome "this great spit" and that you (Weizmann) will experience the satisfaction of creating a happy Jewish community. He ends the letter with warm wishes. Einstein and Weizmann had been close friends since the 1920s, when Weizmann traveled to the United States for the first time in 1921 on a Zionist mission. (It is told that when they disembarked from the ship in the United States, journalists asked Weizmann whether, after their long stay together on the boat, he comprehends the theory of relativity. Weizmann retorted that they did indeed discuss the theory of relativity a lot, and he has no doubt that he (Einstein) understands the theory of relativity very well ...). After Weizmann's passing in 1952, Einstein was offered the position of president of the State, but he turned it down. Background: Chaim Weizmann (1874-1952) was one of the most prominent leaders of the Zionist movement, and his diplomatic activity was one of the primary causes of the establishment of the Jewish state. Weizmann's first claim to fame was when he discovered a new species of bacteria which was used to produce acetone, proving very beneficial to British military industry in WWI. Weizmann was active in the Zionist movement from its inception. He was elected president of the Zionist Congress in 1921 and served in this capacity until 1946 (except for a two-year hiatus, 1931-1933). leaf paper. 28x21.5 cm. Typewritten on an official imprinted paper blank with Einstein's handwritten signature. Fine-very fine condition, tiny holes in the upper left of the leaf (apparently from removing staples), filing holes.